Treat your combs, bees and yourself to the very best uncapper available. Our uncapper uncaps combs at the rate of 12 combs per minute or 80 supers per hour. The feed chain holds 2 boxes of combs at a time. The main part of this uncapper is what we call the “Head”, where the cutters and motors are located. The Head is bolted to the top of an eight-foot stainless steel tank. The combs are placed in the Head and two silent chains carry them through the revolving cutters, which remove the cappings. The uncapped comb then rests on a chain that slowly conveys it toward the other end of the tank. There is room for fifty frames to rest until the extractor is ready for them. The cappings that are cut off, do not fall onto the combs that have been uncapped. As the combs pass through the cutters, they are held in place by a very rigid guide system. The depth of the cutting can be instantly changed; an adjustable slip clutch is provided. The value of this combination is to reduce breakage of frames in case a frame is started crosswise. If this should happen, the clutch stops the chains. The cutters are powered with 3/4 h.p. motors, using belt drives. 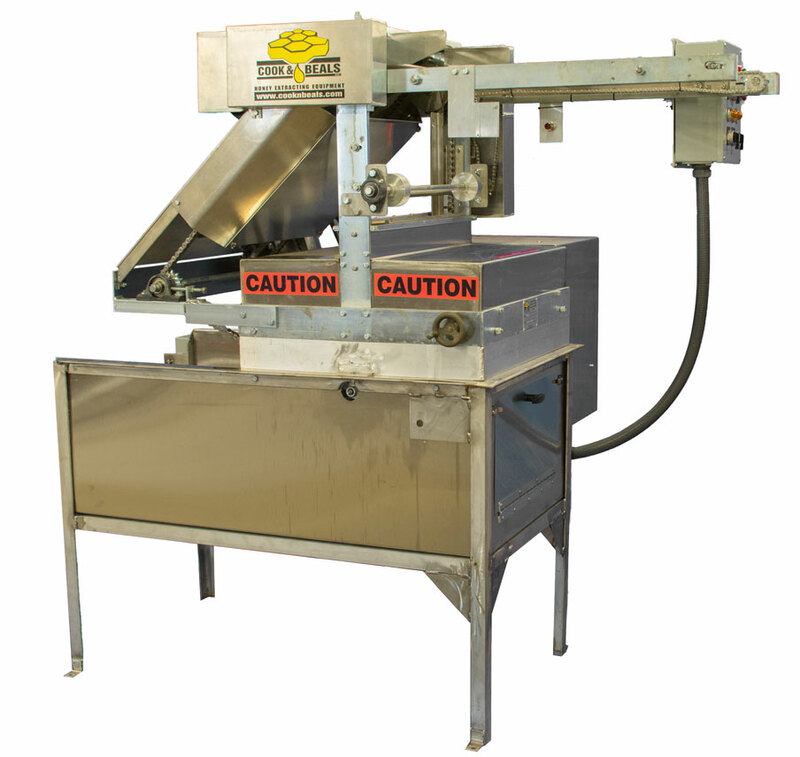 A stainless steel shield over the cutters prohibits any capping or honey from being thrown out.